Innovation, creativity and caring for Reserve citizen airmen and their families are just some of the words to describe initiatives of the 446th Airlift Wing Airman and Family Readiness (A&FR) office. The A&FR team was recently notified it was selected as the 2018 Department of Defense Reserve Family Readiness Award winners. The prestigious award, established in 2000, honors the top unit in each Reserve Component demonstrating outstanding family readiness. Ms. Jill Marconi-Pyclik, A&FR director and her seven-member team included: Tech. Sgts. Heidi Hancock, Troy Gordon, Jeffrey Toevs, Andrew Mutch, Master Sgts. James Ward and Kathy Myhre. Along with 446th Mission Support Group Commander, Col. Ray Luevanos, the team, will be honored at a ceremony at the Pentagon, Washington, D.C. March 29. This isn't the first time Ms. Marconi-Pyclik was recognized for her outstanding performance. In 2016, she led a winning team at the 434th Air Refueling Wing at Grissom Air Reserve Base, Indiana. Achieving excellence wasn't without hard work for the team. The Rainier Wing was without an A&FRC director for nearly a year before Ms. Marconi-Pyclik was hired. There was little doubt when she hit the ground running hard! "Every process had to be revamped," Marconi-Pyclik said. "I provided the guidance and continuity they needed as a director." Early on, she encouraged her airmen to track every accomplishment. "We found out we received the award during one of the snow days. I opened an email by the wing vice commander congratulating us on the award," Ms. Marconi-Pyclik said. "I texted my team and they were shocked and excited." Col. Tony P. Angello, 446th AW vice commander, received notification of the award via email by Under Secretary of Defense for Personnel and Readiness leadership and wrote in response he was not at all surprised Jill's team garnered the award. "What an honor for Jill and her team," Angello said. 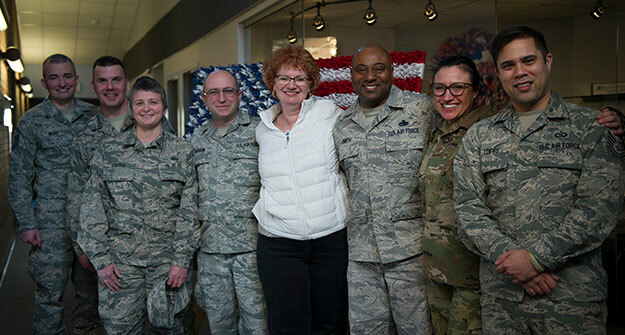 "They are so dedicated to serving the families and airmen of our wing. It's no wonder they are bringing home this prestigious award!" "In a year and a half, my team has overcome challenges by leaps and bounds," Ms. Marconi-Pyclik said. "She created a game plan to get the unit into shape," Hancock said. "She took away some programs that didn't fall under us and added programs we weren't doing." One such unit accomplishment included the overhaul of the Transition Assistance Program (TAPs), a Department of Defense-mandated program assisting separating servicemembers during their period of transition into civilian life. Ms. Marconi-Pyclik, along with other team members, worked tirelessly to whip the program into shape. They completed an eight-step Continued Process Improvement problem-solving process addressing the shortfalls. "Getting TAPs back on track was a huge accomplishment," Hancock said. "We didn't know who was due." "We are out there putting in work," Hancock said. "We tell the airmen in the units, ‘Hey, don't forget about us, stop by and see us when you deploy or when you separate.'" "Our job is to tell airmen how they can receive help; we are a resource for them," Hancock said. "I am proud to serve the airmen and their families in our community." "I'm kind of like a social worker for the Air Force," Hancock said. "You need to have empathy for others and a willingness to help and provide the services to those who need it."